BLOOMINGTON – They better clear a big spot in the athletic trophy cases at Elkhart Memorial High School. 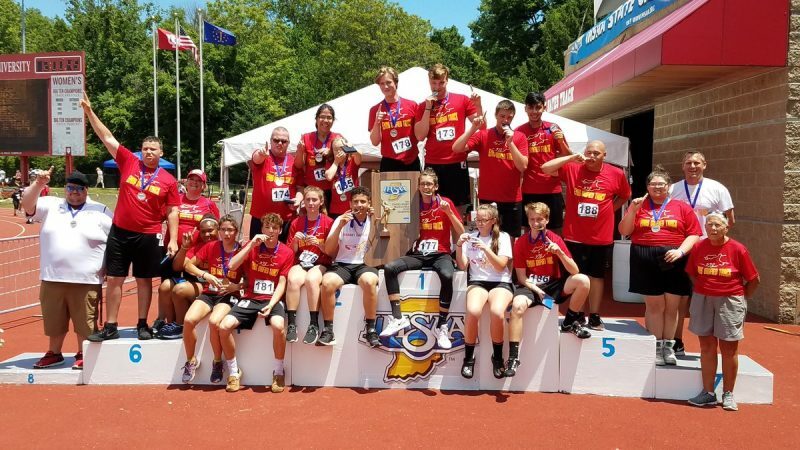 The school’s Co-Ed Unified Track Team claimed a state championship Saturday to bring home the big hardware. The state title, won prior to the Boys’ Track State Finals at Indiana University, is the first team state championship in the school’s history. Memorial, just in its second year of competing in Unified Track, scored 104 points to earn the title. Merrillville, which won the state title a year ago, was right behind with 101 points. Columbus East was third with 94 points. A total of 10 teams competed in the State Finals. The Crimson Chargers got first-place finishes Saturday in heats of the long jump from Logan Mullins and Roberto Moto. Lexi Patrick was first in the 100 with Julian Williams first in the 400. The team of Emily Kerson, Trinity Fine, Dixi Ponce-Acevado and Tati Ponce-Acevado won the 400 relay for the champs. The trio of Tyler Lehman, Brian Ketchum and James Goldsborough each placed second. Lehman was second in the 400 with Ketchum second in the 100 and Goldsborough second in the 400. Memorial, which is coached by Todd Sheely, began Unified Track three years ago as a Special Olympics Club Sport. The Chargers were sectional runner-up a year ago before concluding their season in the regional. Memorial placed second last weekend at the Kokomo Regional to earn a State Finals berth. Memorial is one of 130 schools statewide to now have a Unified Track team. Five years ago when the sport started there were just 13 teams in the state for the sport which is sanctioned by the IHSAA. The Memorial team has 32 athletes this season with 16 partners and 16 athletes. The 16 athletes are high school boys and girls who have cognitive disabilities and are special education students. The 16 partners at Memorial include among others Lehman, who was the starting quarterback for the football team, along with several cheerleaders. Sheely, who is also the boys soccer coach at Memorial, is in his second year as the Unified Track coach. The Chargers also had another honor Saturday as Carson Hill sang the National Anthem prior to the meet. Memorial joins Warsaw, Lafayette Jefferson and Merrillville as state champions in the fifth year of the event. Warsaw won the first state title in 2014 with Barb Martz as coach and won again in 2016 with Brenda Linky as coach.